Home » texts » quote » Kale and Turnips—Not! Last week, I ran into a rabid vegetarian at the Ralph’s Supermarket in Santa Monica. She had her groceries in two piles, momentarily confusing the checker, who asked me if her second pile was mine. This angered the customer, who turned to me and started critiquing the groceries I was purchasing, much of which was for Martine, who has been ill with a bad cold. I stayed silent until she slunk away with a sour look on her face—a look that could only be the result of eating a diet of kale and turnips. Actually, I consider myself a part-time vegetarian. The one difference between me and the other customer is that I refuse to eat bland, tasteless food, regarding it as an insult. I was raised on Hungarian food, some of which was vegetarian, especially when times were bad and we couldn’t afford meat. But it was good food and tasted great! I cannot for the life of me stomach American vegetarian cuisine, which I find objectionable in the extreme. Hungarians have good vegetarian dishes, as do Italians and Persians. The best vegetarian chow, in my opinion, is from the Indian subcontinent. Indian curries are the epitome of a great vegetarian cuisine, such that I prefer to cook vegetarian when I make curry. In preparation, I visit an Indian specialty food store, such as India Sweets & Spices in Culver City, where I can buy curry leaves, black mustard seeds, good turmeric, cumin, and coriander—and where the owner usually gives me a cup of chai masala for free. In fact, if Martine were not still hitting the soup trail for her cold, I would cook a potato and spinach curry this week. One of the oldest books I own is Monica Dutt’s The Art of Indian Cooking, which has been my guide to learning how to cook curries. 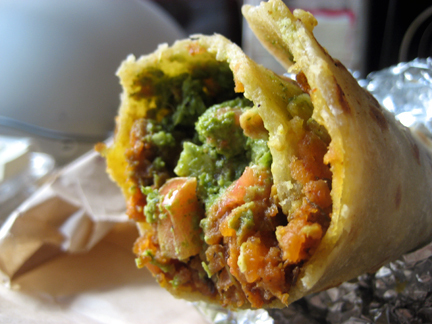 Today I had an Aloo Gobi Matar wrap (as illustrated above) at the Bombay Frankie Company in West L.A., which is located at one end of a Chevron Station at the Santa Monica Boulevard exit on the I-405. This entry was posted in quote and tagged curries, india, vegetarians. Bookmark the permalink. Mexican vegetarian/pescatarian is quite good as well. I never liked American vegetarian, which seems more like punishment than food. Like it or not, the hamburger diner plate, followed by a massive slice of pie, is what we do best. And I like it all too well! I agree. I love chile rellenos or potato and poblano chile tacos. And have you ever had nopalitos (marinated prickly pear cactus pads) — delicious! You’re convincing me. I’ll try them.